Over the past few years, the medical 3D printing technology has exploded with researchers being able to print a new ear, trachea, and even the skull to implant into patients. 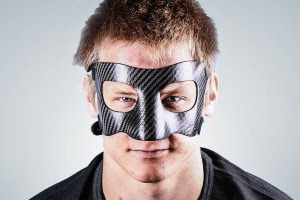 However, a more common application of medical 3D printing technology is to create custom, form-fitting facial protection masks for athletes who have suffered from facial and/or nasal fractures. With such protection, an athlete could potentially resume play within weeks rather than being out for the rest of the season. Of course, generic nasal fracture masks have been around for over a decade and can be purchased on Amazon, but for facial and or jaw fractures, custom masks are required given there are too many variables for a viable generic mask because the fracture could be located anywhere affecting where the pressure points and protection needs to be located. If there are others, please comment below so they can be added! However, handmade (rather than 3D printed) masks can also be made by any local experienced and certified prosthetist/orthotist. You can find a prosthetist/orthotist using a directory maintained by the American Board for Certification in Orthotics, Prosthetics, & Pedorthotics.